Operating a small business is a challenging venture at any time, but in these tough economic times, any financial loss can be a serious threat. Aon Canada offers a variety of small business insurance solutions to help offset the risks you face. Business owner&apos;s package: an all-in-one small business insurance policy that includes commercial property, general liability, business interruption and crime insurance. Accounts receivable (AR) insurance: protection against losses from customer insolvency or bankruptcy. Commercial auto insurance: coverage for cars, trucks, vans and trailers used in the operation of your business. We also offer economical fleet insurance for five or more commercial vehicles. 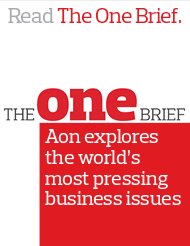 Aon offers the small business owner choice, advice, fast service, and expert claims advocacy. Fast service - our streamlined application process saves you time and lets you focus on running your business. Convenience - our national operations centre offers bilingual service from professional insurance brokers who are licensed in multiple provinces. Affordable rates - Aon's position as the globe's #1 broker ensures that you get access to affordable rates from highly reliable insurers. Claims assistance - experienced, knowledgeable voice that speaks for you in the event of a claim.